PRESS RELEASE: Mapex USA announced the introduction of Horizon, an entirely new drum series for 2010. The all-basswood drums feature newly designed appointments, including lugs, mounts, badges, and bass drum claws. All Horizon drum sets include a full set of all-new Mapex 500 Series Hardware, a padded throne, and a setup and instructional DVD. The Horizon features 7.2mm, basswood shells with newly designed, low mass lugs. These small profile lugs are mounted to the shell using only a single point of contact, minimizing the holes drilled into the shell and thereby enhancing resonance. Horizon Series drums also Remo drumheads, including a self-muffling bass drum batter head. The Horizon's bass drum claws are newly designed to be low in profile and include cushioned gaskets to protect the bass drum hoops. The bass drum's tom mount features new styling and a recessed adapter to accommodate an optional cymbal arm. Horizon Series drums use the Mapex-exclusive Isolated Tom Mounting System (ITS). 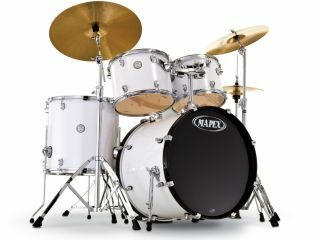 The lightweight and compact system employs Mapex's unique combination of off-the-shell mounting hardware that allows the drum to resonate more freely, improving projection and sustain. The Horizon's ITS features a interlocking tom bracket that ensures secure positioning as well as quick and easy set up and tear down. All Horizon drum sets feature newly designed Mapex 500 Series Hardware. The 500 Series includes many features that were introduced with the 700 series hardware including newly styled memory locks and Multi-Sustain Cymbal Felts, that allow players to use any combination of plastic or felt on their cymbal stands for more precise cymbal sustain. All sets include a T250A padded throne, and a Mapex 500 Series Boom Stand (with a hideaway boom arm), a straight cymbal stand, snare stand, hi-hat stand, and a bass drum pedal. Mapex Horizon drum sets also include an instructional set-up DVD, hosted by Drumming's Global Ambassador and Mapex Artist, Dom Famularo. Horizon is available in seven durable, high-gloss covered finishes and four 5-piece configurations: Standard/HX5255T (22x18 bass drum, 12x9 and 13x10 tom toms, 16x16 floor tom, 14x5.5 snare drum), Fusionease/HX5245T (22x18 bass drum, 10x8 and 12x9 tom toms, 14x14 floor tom, 14x5.5 snare drum), SRO/HX5295T (22x18 bass drum, 10x8 and 12x9 tom toms, 16x16 floor tom, 14x5.5 snare drum) and Jazz/HX5045T (20x18 bass drum, 10x8 and 12x9 tom toms, 14x14 floor tom, 14x5.5 snare drum). MSRP for five-piece Horizon drum sets starts at $929.00. An optional Mapex cymbal pack is also available with the Horizon. The pack includes a set of 14" hi-hats, a 16" crash, and a 20" ride. The Horizon Series replaces the QR Series product line, which has been discontinued.